Australia�s best V8 Dirt Modified and AMCA National drivers will converge on Hi-Tec Oils Toowoomba Speedway this Friday and Saturday night for a double-header title fight thanks to Super Rooster. With teams travelling from all over the country the two-Championship contest will be hotly contested affair as the respective defending champions lay it all on the line. V8 Dirt Modified supremo Kevin Britten shoots for another page in history as he attempts an incredible �four-peat� result that is considered virtually impossible in any form of Speedway racing. Should he be successful this weekend Kevin will break his older brother Peter�s record (who has also won three consecutive national titles) and become the first person to ever win four in a row. Britten leads an all-star field in the Bulk Fuels Australia sponsored title that is also umbrella sponsored by Toowoomba poultry icon Ray Klarich and his tasty chicken food chain Super Rooster. Klarich, a popular veteran of the V8 Dirt Modified class in Toowoomba will also line-up for battle in his distinctive #95 entry. The field is brimming with former national and state titleholders and whilst the previously hat-trick winning Britten comes into the event as hot favourite there are many challengers standing in the way of his shot at history. 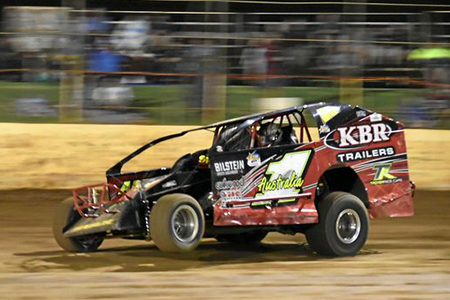 The high speed high banked Hi-Tec Oils Toowoomba Speedway is perfectly suited to the brutishly powerful V8 Dirt Modifieds as the title comes to Charlton after a two-decade absence. Former national champions in the field include Mark Robinson, Jai Stephenson, David Clarke, Andrew Pezzutti and Scott Cannon and all five are primed for their shot at Britten�s supremacy. The Australian AMCA National title will be no less competitive with a field that includes drivers from all states and territories as defending champion Jeremy Moore puts his #1 on the line. Moore will have a torrid time keeping his status as former national champions and multiple state champs combined take a serious shot at him over the two nights. Naturally the Queenslanders will take a power of stopping on their home track but the beauty of AMCA National competitors is that they regularly travel across the country and often acclimatise themselves quickly. Two former national titleholders in particular � Tim Reidy and Matt Hardy � will take a power of stopping in their respective bids to re-secure the Australia #1 status. Current QLD titleholder Nathan Durston must surely rate a big chance also as drivers from the Northern Territory, Western Australia, South Australia, New South Wales and Tasmania roll through the pit gates. Racing is on both Friday and Saturday nights � January 18/19 with a huge fireworks display also programmed for the Saturday night. The fireworks in the air will be nothing compared to the ones on track. Official practice is Thursday night, January 17. Racing starts 6pm both Friday and Saturday night.